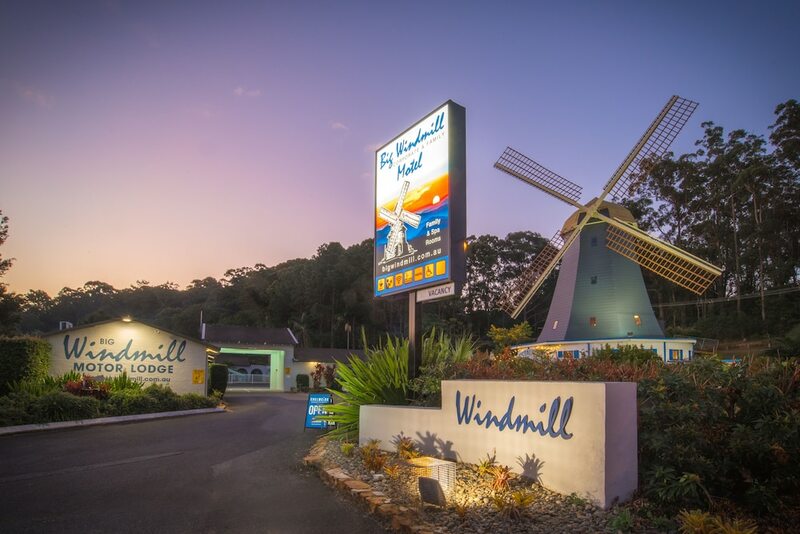 A stay at The Big Windmill places you in the heart of Coffs Harbour, within a 10-minute drive of Coffs Harbour Golf Club and Park Beach. This motel is 3.1 mi (5 km) from Jetty Beach and 3.1 mi (5.1 km) from Coffs Harbour Marina. Make yourself at home in one of the 39 air-conditioned rooms featuring refrigerators and LCD televisions. Complimentary wireless Internet access keeps you connected, and cable programming is available for your entertainment. Private bathrooms have complimentary toiletries and hair dryers. Conveniences include phones, as well as desks and coffee/tea makers. Take advantage of recreation opportunities including an outdoor pool and a waterslide. Additional amenities at this motel include complimentary wireless Internet access, a picnic area, and barbecue grills. Enjoy a meal at the restaurant, or stay in and take advantage of the motel's room service (during limited hours). Buffet breakfasts are available daily from 7 AM to 9 AM for a fee. If you are planning to arrive after 8:30 PM please contact the property in advance using the information on the booking confirmation. Please note that reception hours on public holidays are from 7 AM to 6 PM.